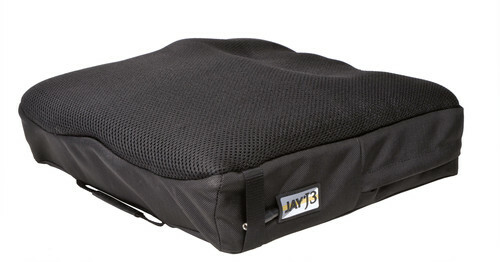 The JAY® J3® wheelchair cushion provides outstanding stability and optimal pressure distribution for the client at high risk of skin breakdown, and offers the choice of JAY Flow® fluid or ROHO DRY FLOATATION® air inserts. The J3 features a contoured foam base constructed from closed cell foam. This makes it easy to modify in our factory or in the field. Additionally, an extensive selection of positioning components are available. The J3 provides exceptional lateral and forward stability for individuals with changing needs or unique postures. 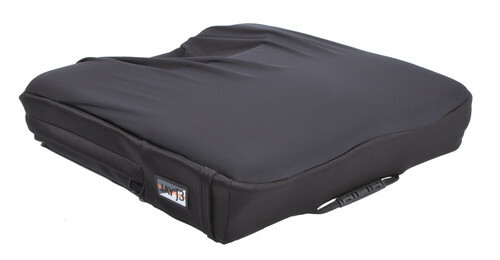 The J3's customizable Pelvic Loading Area sizes are selected separately from the wheelchair cushion width. This provides ideal forward and lateral stability, optimal immersion, and weight distribution that accommodate a broad range of client needs. The J3 may be ordered with JAY Flow fluid or ROHO DRY FLOATATION air inserts, which conform to each individual's shape, adjust to sitting positions, and ensure proper fluid placement beneath bony prominences to help protect the skin from breakdown. The JAY Flow Field Variable option's fluid levels and ROHO DRY FLOATATION's air levels may be adjusted in the field to accommodate asymmetrical postures and changing needs. Width Range 12" to 24"
Depth Range 12" to 24"
Air Dual Valve: 2.9 lbs.